Smartphones with bezel-free screens are all the rage this year, whether it’s Samsung curving the side of the Galaxy S6 Edge, ZTE minimizing the bezel on the Nubia Z9, or Huawei cleverly disguising them on the P8 — screen bezels are out. A new leak shows Sony may be getting in on the act with a phone codename the Lavender. The news comes from known phone leaker @Upleaks, and consists of a small photo of the phone, plus a potential spec list. The leaked picture shows a minimally bezeled screen, and above it, an oversized camera lens with what could be a flash unit next to it. It’s described as a selfie-focused phone, which fits in with a current Sony trend of fitting a massive camera to the front of its phones. A good example is the new Xperia C4, which has a 5-megapixel front cam complete with an LED flash. Apparently, the Lavender may be closely related to the C4, but with an even larger and possibly almost bezel-free screen. Could it actually be the C4, just photographed badly? 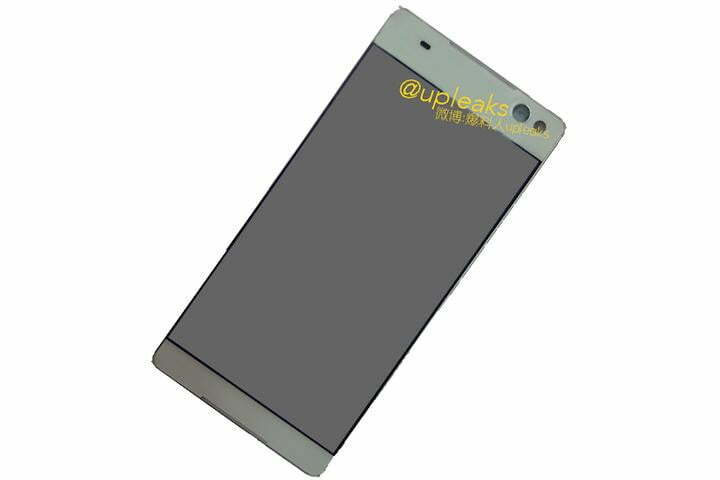 Possibly, but the body doesn’t really resemble the C4, so it’s unlikely we’re looking at the same phone. If the leak turns out to be accurate, the Lavender’s front camera may have an even more impressive 13-megapixels, putting it level with HTC’s crazy Desire Eye smartphone. If Sony’s using selfies to standout from the crowd, it’ll need to go crazy with the megapixel count. The leak provides a few other possible specs, including a MediaTek 1.7GHz octa-core processor — the same as that found inside the Xperia C4 — with 2GB of RAM. The 1080p screen may exceed the C4’s 5.5-inch panel in size, and display Android 5.0. There’s no hint of the Lavender’s release yet. Recently, Sony has chosen to release its Xperia phones in only a few select places, so even if this bezel-free selfie phone is made official, there’s no guarantee it’ll be sold outside Japan or other parts of Asia. However, we’ll continue to keep you updated with more news on this good-looking phone.